The website's front page in June 2012. 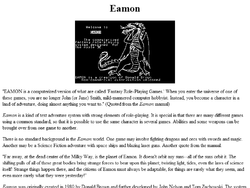 The Unofficial Home Page of Eamon Games is an Eamon website created in the 1990s by Fredrik Ekman, then a student at Linköping University in Linköping, Sweden. The site provides a brief introduction to the game, lists of adventures, email addresses of authors and contributors, and links to various online resources. The site was last updated in May 1999 and most of its external links are now broken. Ekman's site continues to be hosted by Lysator, a large academic computer society at Linköping University. Founded in 1973, Lysator describes itself as the oldest computer society in Sweden and operates from the ~ (Tilde) Room on the main floor of Building B on the university's Campus Valla. Since 1990 the society has also operated NannyMUD, a fantasy-themed multiplayer text adventure with some Eamon-like features, including an "Adventurers' Guild". This page was last edited on 14 April 2019, at 07:00.